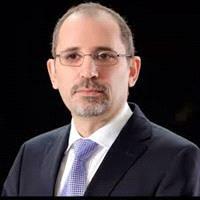 AMMONNEWS - Minister of Foreign Affairs and Expatriates Ayman Safadi on Monday met US Special Representative for Syria Engagement James Jeffrey and Deputy Assistant Secretary and Special Envoy for Syria, Joel Rayburn, who visited the Kingdom as part of a regional tour. Safadi discussed with Jeffrey and the accompanying delegation developments in the Syrian crisis and efforts to find a political solution to the conflict. The Foreign Minister stressed the need to intensify efforts to reach a political solution to the Syrian crisis that safeguards the country's unity, and that is accepted by the Syrians in accordance with UN resolution 2254 and the Geneva process. They also tackled the issue of Syrian refugees, where Safadi briefed the US delegation on the huge burdens Jordan had to bear for hosting 1.3 million Syrians, urging the international community to continue to shoulder its responsibility towards the displaced Syrians. Jordan, the minister stressed, encourages the voluntary return of Syrian refugees to their country. Safadi and the US team also talked about the latest developmnts in the war on terrorism, and the two sides agreed on the need to continue working within the international coalition to defeat the terrorist gangs.